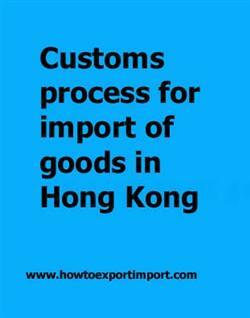 What is the customs process in Hong Kong to import? How is import cargo released from Hong Kong Customs to importer? Who are the parties involved in import customs clearance formalities in Hong Kong? Import cargo clearance in Hong Kong Customs. The information provided here details on how to import goods to Hong Kong especially import customs clearance procedures in Hong Kong. Government Electronic Trading Services (GETS) : To maintain Hong Kong's competitiveness in the global business community, the Hong Kong Special Administrative Region Government has been promoting the wider adoption of electronic commerce in the trading community since the early 1990s. Brio Electronic Commerce Limited, Global e-Trading Services Limited and Tradelink are currently the service providers providing front-end services for the electronic submission and processing of certain official trade-related documents known as the Government Electronic Trading Services (GETS). The Government reserves the right to appoint further service providers in future. The information provided here details on how to import goods to Hong Kong especially import customs clearance procedures in Hong Kong . Whether products sent by a taxable person to a job worker be treated as supply and will they be liable to GST?